"I was amazed to discover that such beautiful music could come from one un-amplified guitar." Received B.A. in Music at U.C. Berkeley. Played electric guitar in numerous bands and studied classical guitar with Byron Pang, Rey de la Torre, George Sakellariou and Christopher Parkening. Studied jazz guitar with Warren Nunes and Bud Dimock. Taught classical guitar at the Music and Arts Institute as Rey de la Torres' assistant, and at Guitar Solo in San Francisco. Played in the band Aggregation (later called Full Circle) at the Santa Clara Valley’s top hotels and country clubs; also performed solo engagements on classical guitar. Worked as music transcriber for Guitar Player Magazine, Warner Bros., Music Sales Corp, and AMSCO. Projects included music by ACDC, B.B. King, Stone Temple Pilots, and Guns n' Roses. Received community college credential in music from the State of California and taught guitar classes at Evergreen College in San Jose, California. Full Time guitar Instructor at World of Music store in Cupertino, California. 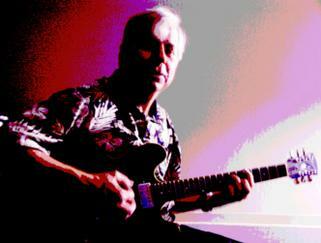 Full Time Guitar Instructor with studios in various locations in Cupertino and Santa Cruz. Classical guitar solo engagements, jazz performances with the Nick Williams Group, and mixed style performances with various other groups. I started playing the guitar in the 1960’s. Like a lot of kids, I was drawn to the rock and roll music of that era and learned to play in the styles of the rock guitar players of the day. I learned solos by ear, emulating players such as the Beatles, The Rolling Stones, Eric Clapton, Jimi Hendrix, Michael Bloomfield, Jimmy Page, Chuck Berry and many others. I was fortunate to have teachers who taught me to read music on the guitar, which was a rare thing at the time. This gave me a good foundation for learning by ear, and it enabled me to gain a true musical understanding of the music that I loved. In my mid teens I heard Andres Segovia, the Spanish classical guitarist who I heard was the best in the world. I was amazed to discover that such beautiful music could come from one un-amplified guitar, and knew immediately that I had to learn to play that way as well. This change in focus did not interfere with my ability to play rock and roll; in fact, it helped a great deal. I became more flexible musically, and it enabled me to easily learn pretty much any style of music. I branched out into jazz and blues as well. And while still in high school, I started earning money by playing at dances, mostly with pop, rock and jazz groups. I pursued my classical guitar studies with considerable determination after high school while still playing in bands to pay the bills. When I was a music student at U.C. 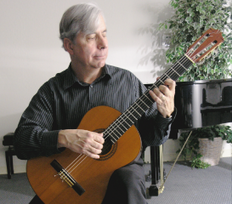 Berkeley, I was invited to by my guitar professor, Rey de la Torre, a pioneer of modern classical guitar technique, to become his teaching assistant at the Music and Arts Institute of San Francisco. I taught there for about 5 years, becoming the primary instructor after Rey relocated. While at Berkeley I also studied with classical virtuoso George Sakellariou, who had been a student of Andres Segovia. teaching and performing in a variety of styles.